The use of robotics in services for seniors is growing worldwide. Though the U.S. has not yet embraced robots as aggressively as some other nations, a few LeadingAge members are piloting the possibilities. According to MIT Technology Review, the United Nations predicts the global over-65 population will increase 181% by 2050, while the 15-to-65 population will rise only 33%. This dire ratio means that elder care will be greatly shorthanded in the years to come. One of the most challenged countries is Japan, which already has 30 million people in care facilities. An obvious solution to the human and financial pressures of aging populations are robotic caregivers—a concept that Japan has taken seriously, having invested millions of dollars in elder-care robotics research and development. According to a U.S. Census Bureau report, the number of Americans aged 65 or older will nearly double, from 43.1 million to 83.7 million, between 2012 and 2050. Recognizing the need, organizations such as the National Science Foundation and National Institutes of Health are investing in elder-care service robots. In December 2016, IBM Research announced the creation of the IBM Multi-Purpose Eldercare Robot Assistant (IBM MERA), designed to assist the elderly and their caregivers. Functions include measuring vital signs, answering basic health-related questions and determining if an individual has fallen. "Now is the time to invest in and empower our aging population so they can live more independent lives," says Arvind Krishna, senior vice president for IBM Research. "Our research on embodied cognition, which can combine real-time data generated by sensors with cognitive computing, will help clinicians and caregivers make better care decisions for their patients." So—not convinced robots are the way to go? Think they are too expensive? That they won’t be accepted by staff or residents? They aren’t personal enough? Or the learning curve is too steep? Some LeadingAge member organizations are gaining experience with robots, helping researchers assess the possibilities for these technologies for the decades to come. In 2013, leaders of the Front Porch Center for Innovation and Wellbeing (FPCIW) visited The Forest at Duke, a life plan community in Durham, NC, where the team witnessed how a robotic toy dog created considerable interaction in the memory care neighborhood. Residents were more engaged and social, and staff members reported a reduction in stress when they used the robot with residents and in group reminiscence therapy sessions. Dr. Takanori Shibata. Photo courtesy of Front Porch. After some market research, FPCIW launched a pilot program at Front Porch’s Sunny View community in Cupertino, CA. 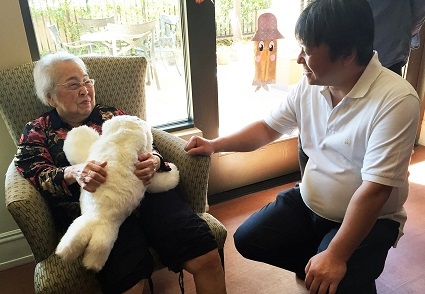 The community’s care center and memory care neighborhood was presented in early 2014 with PARO, an advanced therapeutic robot that looks like a baby seal and responds to stimulation, such as stroking or speaking. “The goal of the pilot was to measure the effectiveness of PARO and see how it contributed to the caregiving experience,” says Davis Park, director of FPCIW, who also hired a licensed robotic therapist to train the care team. The outcomes of the pilot led FPCIW to purchase and deploy additional PAROs, which continue to validate the initial findings of the pilot study. Perhaps most surprising to Park is the enthusiasm and adoption of the devices among the caregivers. the TeleHELPER robot, Gabby, to a resident and her husband. Photo courtesy of Vincentian Collaborative System. 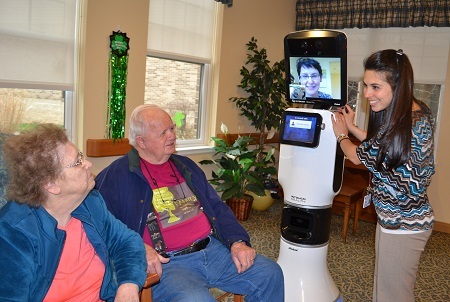 Affectionately nicknamed Gabby, this robotic mobile video conference system has facilitated more than 300 care conferences, where members of the interdisciplinary team meet with residents and their families to discuss residents’ successes, needs and care plans—in person as well as through group video conferences. Remotely controlled via laptop or smartphone, Gabby is programmed to navigate the floorplan of each community and can be sent to resident rooms, offices or its docking station. A camera and sensor prevent collision with walls, equipment and people. In April 2015, Maple Knoll Communities, which operates life plan communities, affordable senior housing, home health and hospice services in Cincinnati, OH, finalized a formal affiliation with the University of Cincinnati. The affiliation comes after a 30-year history of collaboration in nursing, medical, and pharmacy education and practice. A key focus of the joint research is implementing robotics and other telehealth technologies in senior-care settings. Maple Knoll Communities and the university currently have several projects under way that involve robotics. An InTouch Health robot is used by the director of nursing to conduct rounds, see residents and optimize time spent with staff. The robot can measure vital signs like blood pressure and also take and transmit high-resolution photos to a health care professional for evaluation, in real time. A VGo robot deployed in the independent living apartment complex provides visual and communicative assessments, but does not measure blood pressure or other vital signs. Nursing and engineering students are part of the workforce team that manages the projects. Initial results show the residents willingly accept the robotic technology as a form of two-way communication. Students also studied the robots’ effectiveness in delivering chronic-care, person-centered education modules. 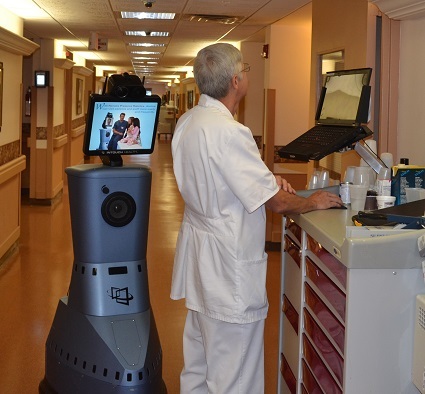 The success of this work has led to the development of a pilot program called the Telehealth Community Health Assistant Team (T-CHAT), which places a remote-presence robot with consenting residents to assist in daily activities. An expanded version of the pilot is planned for later in 2017, followed by a demonstration project in the spring of 2018. Maple Knoll Communities plans to expand the reach of T-CHAT from independent apartments to the affordable housing apartments. A special telehealth clinic is also being established for the project. Advancements in robotics will lead to increasingly multi-functional elder-care robots that connect to appliances and home automation systems, providing real-time access to family members for checking on their loved ones remotely. Other robot capabilities will capture and transmit medical diagnostics, as well as use facial recognition algorithms to determine how someone is feeling—all essential functions for creating smart senior living residences. 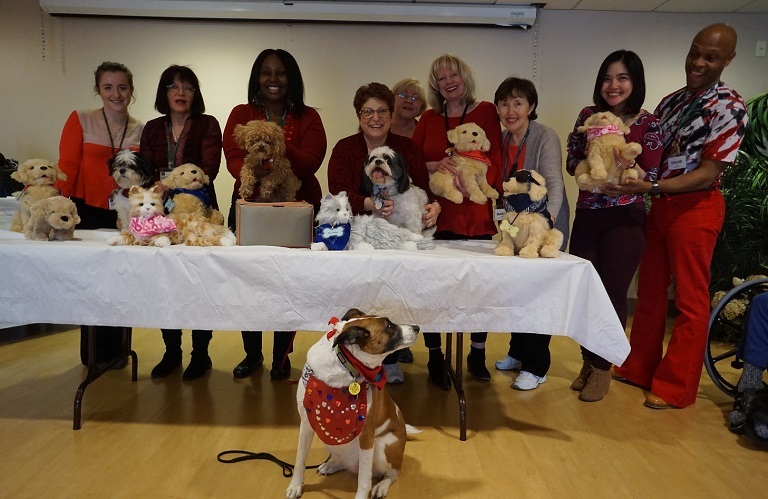 Inspired by the Westminster Dog Show, the Jewish Home Family, Rockleigh, NJ, recently held its very first “Rockminster” dog show, featuring both live animals and robotic companion pets that respond to both sound and touch. The robot pets feel and look real, can be petted endlessly, and are available for residents at any hour. Many residents have formed strong bonds with these animals, connecting with them as they would a live pet. Recreation staff at the Jewish Home at Rockleigh pose with the pets. Photo courtesy of The Jewish Home Family. Individual residents who respond particularly well to these robots helped craft the pets’ back stories for the show, assisted by members of the recreation staff. Although the robot therapy pets received plenty of cheers and raised hands, Bentley, a (real) toy poodle owned by activity director Tracey Couliboly, won first prize. For the robot dogs, there is always next year! - Mark Crawford is a writer who lives in Madison, WI.